Veronica Brown, 92, was welcomed into Heaven Thursday afternoon by her Lord and Savior Jesus Christ. Greeting her at the gates of Paradise were her loving husband John Wallace Brown, her precious great grandson William, and her proud parents John and Veronica Batdorf. Visitation will be from 9:30 AM until 10:30 AM at Jefferson Street Christian Church on Monday, December 3, 2018. Funeral services will follow at 10:30 AM. Burial will be held at 1:00 PM at New Union Cemetery. 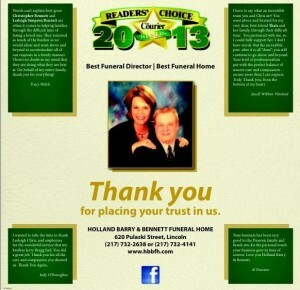 Holland Barry & Bennett Funeral Home has been entrusted with her care. Celebrating Veronica’s well lived life, and continuing in her legacy to love others as Christ has loved us, are her brother Art (Dot), sister Toni, sons: Mike (Penny), Devin (Sharon), and Todd (Pat); grandchildren: Valentine, Ransom, Hilary, Justin, Elizabeth, Wil, and Emily; great grandchildren: Camille, Beau, Lauren, Austin, Connor, Isabella, Everett, Hank, Paisley, Harper, Titus, and Thea. 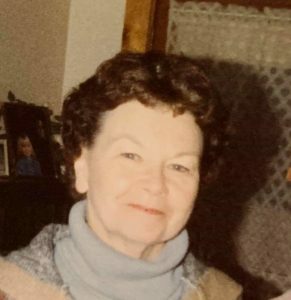 Veronica was a member of Jefferson Street Christian Church, volunteered at ALMH as part of the auxiliary, volunteered at the Blood Bank and the Logan County Food Pantry. She retired from Wyman Gordon Company in Harvey IL. as a Registered Nurse. Memorial donations may be made to the ALMH Auxiliary. Veronica’s passion in life was Jesus Christ and His church and the longtime friends she met there. She was an excellent gardener and always enjoyed nature. Hiking trails with her grandkids, swimming in the lake, and bicycling were some of her favorite past times.